Faith, hope and love behind bars: Ministries shine Christ’s light inside prison walls (reporting from Harvest, Ala.). Page 1 lead. HARVEST, Ala. – Robbery. Murder. Child molestation. The six inmates seated in state prison chaplain Charles Baggett’s office on a recent Wednesday earned their lengthy sentences. 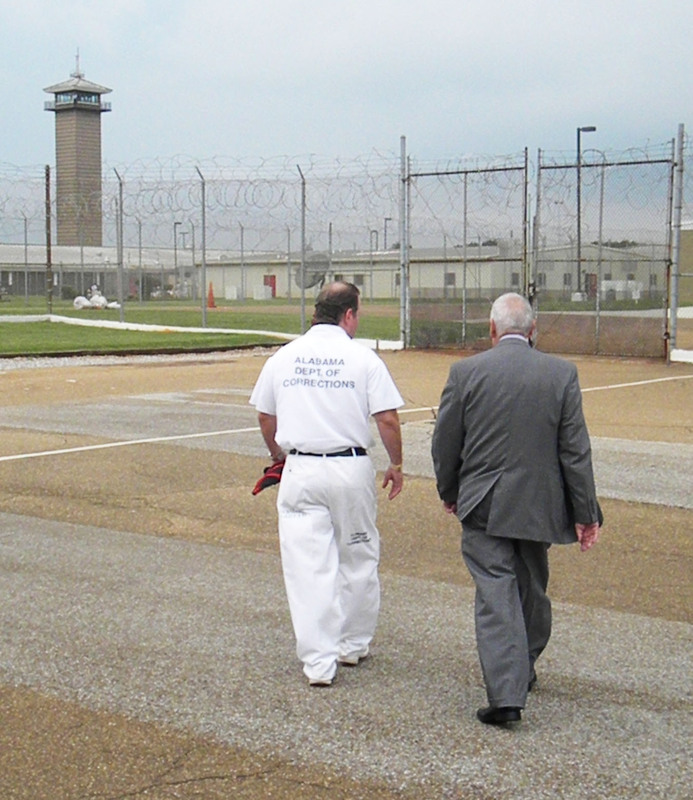 David, Jackie, Michael, Rodney, Tim M. and Timothy W. were condemned to Limestone Correctional Facility, a medium-security Alabama prison, to pay debts to society. But here, in a world of razor-wire fences, tattooed arms and six-digit inmate numbers, these violent criminals came to believe that God sent his only son to pay a debt for them. They found faith — and hope — in Jesus Christ. Now, these brothers in Christ teach, preach, lead singing and work hard to share what they discovered with other inmates. “All of y’all are going to be wearing white one day, too. We just got a jump-start,” joked Rodney, referring to the white prison garb stamped with “Alabama Dept. of Corrections” in bold black letters that identifies Limestone’s 2,400 inmates. Christian higher ed faces challenges (reporting from Nashville, Tenn.). Second Front. Did ‘jailhouse religion’ save Jeffrey Dahmer? Inside Story. Arkansas church mourns flood victims. National. Boys of summer: Profile of Oakland A’s reliever Brad Ziegler (reporting from Anaheim, Calif.). Currents. Boys of summer: Profile of Washington Nationals left fielder Josh Willingham (reporting from Washington). Currents.